Annual. Freely re-seeds. Grows 2-3 feet high. Plant in Spring or Fall. Full sun to partial shade. Soil: Any well drained. Planting and growing instructions included. 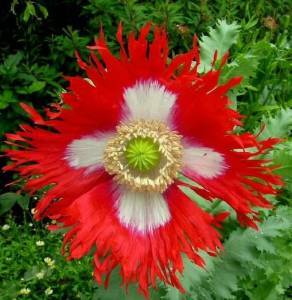 anish Flag Afghan Poppy 250 Seeds - Papaver Somniferum. If you love poppies, this one's a heart-stopper! Bright red, fringed petals with a pure white cross, make a spectacular display. This is the brightest, prettiest shade of Red that I have ever seen! Just Breathtaking! HUGE BLOOMS! Up to 5 inches wide Most poppies are very easy to grow. They are a favorite of gardeners in every state for rock gardens, flower beds, containers, and most anyplace that you want color. Since poppies are self-sowing, if you allow them to go to seed you may only need to plant them once. 250 Poppy Seeds.